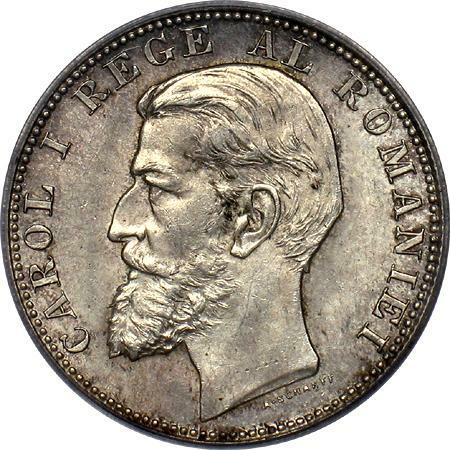 denomination "2 L", year 1894, ROMANIA, Romanian coat of arms, outer pearl circle inscription "CAROL I REGE AL ROMANIEI" meaning "KING OF ROMANIA" and CAROL I head facing left, outer pearl circle. Under the neck lies A. SCHARFF, the engraver's name. In 1894 600.000 pieces were struck in Brussels, in 1900 only 87.279 and finally in 1901 just as few as 12.476, the later two mintages in Hamburg. 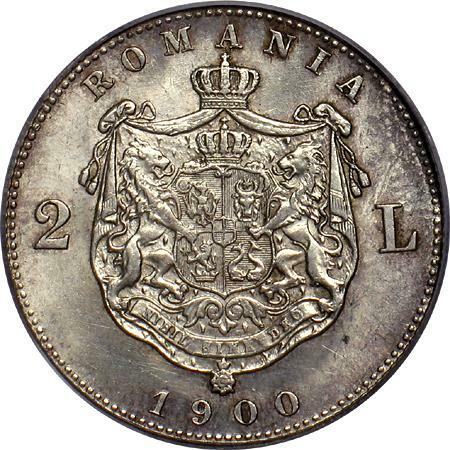 According to the book Monetele României (Coins of Romania, Iliescu and Radovici, 2004), the mintage of 87.279 coins is for years 1900 and 1901 together. All these 2 lei issues are hard to find today. 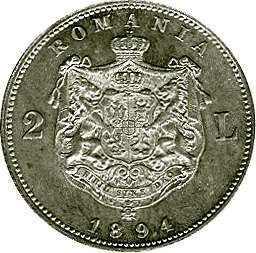 Those struck in 1901, with just 12.476 pieces, are among the rarest Romanian modern coins. The silver used for the Hamburg coins seems to be from the used coins of the '70. The 2 lei 1894 silver coin pictures above are present on this page through the kind permission of Mr. J. M.. 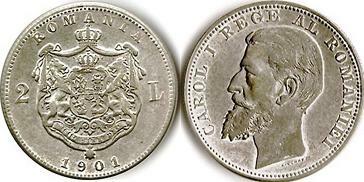 The 2 lei 1900 coin pictures are present on this page through the kind permission of an anonymous donor. Alike the 50 bani and 1 leu pieces, the 2 lei pieces of 1901 are made by modification of the year on the dies manufactured in 1900. As consequence the two digits of 1 differ one from the other in dimension on all values (information received from Mr Radu Lissner). The silver coin pictures at right (mintage: only 12.461 pieces) were also sent for this page by Mr. Radu Lissner. 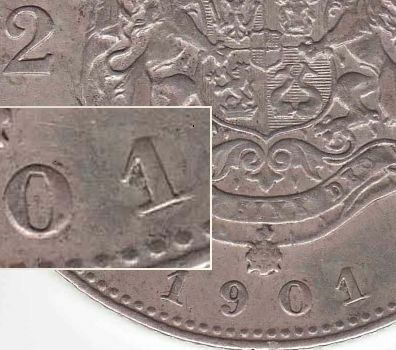 It is said that fraudulently tooled pieces exist, apparently displaying the rare 1901 year - in fact digit 1 was mischievously cut from the last zero of a 1900 piece of 2 lei! 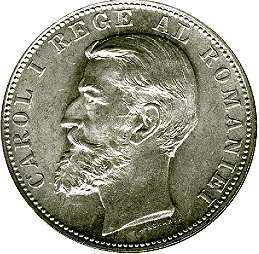 Such a modified coin came from Mr. C. and is presented at left. Romanian numismatics knows lots of fakes. There are the counterfait (or bogus) pieces, as would be the "mărţişor" coins of 1 ban 1883 and 1 ban 1888, replicas pretending genuineness and quite common on the market. The frauds against the state are more numerous. We are talking about fake money which imitated better or worse the official issues and which circulated effectively. Some were obtained through striking, employing methods resembling the ones used in the mint processess and fakes that were cast (molded). The cast fakes have porous surface and corrupt details, due to the technological problems. Usually these counterfaits are made of a different alloy and their diameter is also different. Silver coin fakes are sometimes silver gilt. Below are the images of a fake 2 lei 1894 made from lead. The pictures are present on this page through the kind permission of Mr. Adrian Popovici.